Prospecting. Eucalyptus trees growing directly over a gold deposit can have higher-than-normal concentrations of the element gold. Money may not grow on trees, but gold does—or at least it accumulates inside of them. Scientists have found that trees growing over deeply buried deposits of gold ore sport leaves with higher-than-normal concentrations of the glittering element. The finding provides an inexpensive, excavation-free way to narrow the search for ore deposits. Scientists have long had clues that trees and other vegetation pulled gold from the soil and transported it to their leaves, but the evidence wasn’t clear. The gold particles could have stuck to the leaves after being blown there as dust, for example. To bolster the case that the gold came from soil beneath the trees, researchers conducted a series of field studies and lab tests. Likewise, field tests by Lintern’s group at a site in southern Australia showed that eucalyptus trees growing above a deposit lying 35 meters underground had 20 times more gold in the gummy substances coating their leaves than did trees that grew 800 meters away. Previous studies had noted anomalous concentrations of gold in the leaf-coating substances, Lintern says, but researchers couldn’t discount the possibility that the tiny particles of the metal had stuck to the leaves after being carried there by winds. That’s where the team’s new study gleams. By growing seedlings in greenhouses insulated from airborne dust and watering them with gold-laced solutions, the researchers demonstrated that trees actually pick up the metal from soil and deposit it within their leaves. The scientists report their findings today in Nature Communications. 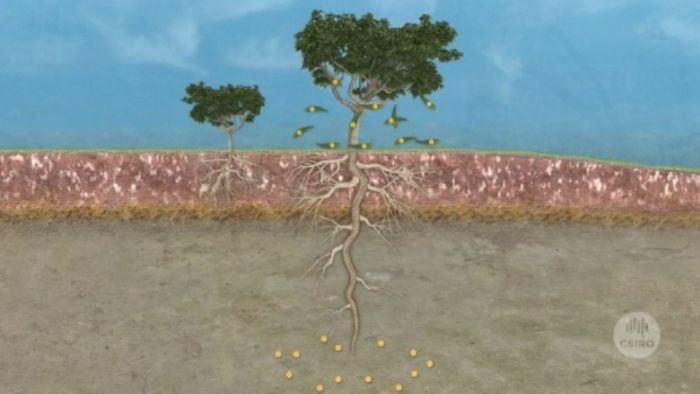 Though the phytonuggets are too small to be collected and mined, they can serve as a sign that gold deposits may lie within the reach of a tree’s roots. Eucalyptus trees, which can grow lengthy taproots to reach deep ground water in arid areas, may stretch down 40 meters. There’s gold in them thar trees. Eucalyptus trees, that is. Australian researchers have found that microscopic gold particles from underground ore deposits are present in tree leaves. The Nature Communications journal results, reported by a team led by Melvyn Lintern of Australia’s CSIRO Earth Science and Resource Evaluation science agency, settle a long-running dispute. Researchers had disagreed over whether gold particles seen in eucalyptus leaves were merely wind-blown or truly represented ore traces transported by roots. “Despite the decline in discoveries, falling ore grades and increasing demand for (gold), new exploration technologies for (gold) deposits, incorporating the deep penetrating ability of certain trees, have been seldom reported,” the study says. The researchers compared eucalyptus tree leaves at gold prospecting sites in Western Australia with leaves from trees 2,625 feet (800 meters) away. They also grew eucalyptus trees in greenhouses with potting soil dosed with gold particles, as well as in normal potting soil without gold. Leaves preferentially stored microscopic gold particles about eight micrometers wide on average. Study authors speculate the particles came from underground, seemingly taken up by the root system of the trees. About 20 leaves needed to be sampled to statistically reveal the presence of gold underneath the trees. “Gold is probably toxic to plants and is moved to its extremities (such as leaves) or in preferential zones within cells in order to reduce deleterious biochemical reaction,” the authors conclude. Don’t start stuffing eucalyptus leaves in your wallet, however. The average concentration of gold in the leaves was only about 46 parts per billion, less than 0.000005 percent of each leaf by weight. For would-be gold miners, however, eucalyptus trees might offer cheaper, and better, clues to gold deposits, especially smaller ones that wide-area drilling tests might overlook. “Mineral exploration will benefit by embracing and understanding” how leaves might reveal secrets hidden underground, the study authors conclude.